Stupid is not the same thing as slow: All the words teachers use to describe student failure. You’re Not Stupid. You’re Slow. Teachers use a variety of words to describe failure. Here’s what they all mean. Failure is diverse. Our language should be, too. You almost never hear that level of candor among teachers, and not just because every parent’s got a lawyer on retainer. Teachers avoid words like stupid because they know how badly labels can sting, and how long the bruises linger. School shapes you, and no teacher wants to leave scars. On the other hand, you don’t educate kids by sparing their feelings and reciting politically correct mantras. You do it by confronting their challenges head-on, and showing them how to overcome them. So when talking to failing students, teachers can’t be too blunt or too circumspect. They’re caught between a rock and a euphemism for a rock. 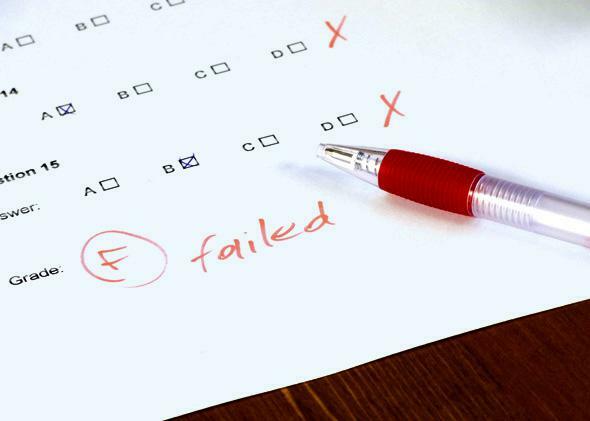 So how do teachers frame failure for their students? What words do they use? I’ve heard slow, weak, struggling, behind, and other words too numerous to list. Students manage to fail in thousands of ingenious ways, and we teachers have developed a vocabulary to match. These words aren’t interchangeable. Each one embodies different assumptions about the engines of success, the nature of failure, and how students’ minds operate. Each word is a bite-sized piece of educational ideology. Consider slow. Its antonym is quick, or in less guarded moments, bright. That’s too bad. Of course, it shouldn’t be taboo for teachers (or anyone) to talk about intelligence. Some people learn to read and multiply at age 3. Some of the mentally retarded never manage to dress themselves, even as adults. Words like smart and dumb can be useful—if crude—catchall terms for the spectrum of human abilities. But intelligence consists of many cognitive skills, from spatial reasoning to word fluency. Slow refers to only one of these: processing speed. The work he’d done was excellent, his reasoning beautiful and precise. He was plenty intelligent—just slow. When we use slow to mean dumb, we conflate speed with intellect. That’s a dangerous move. Our system of time-pressured tests and overscheduled afternoons already favors quick thinkers over deep ones. We ought to reserve the word slow for those specific students with slow processing speed, regardless of their other strengths and weaknesses. Roberto is slow, but he sure isn’t stupid. Next, consider weak (along with its opposite, “strong). At first, such language offers promise. If the brain is a muscle, then exercise—homework and studying—ought to build its strength. But in practice, weak often carries a tone of resignation. “He’s a weak math student,” we sigh. “The sophomores are a weak group this year,” we mutter, shaking our heads. Such weakness lies beyond our control. It feels inevitable that the strong will thrive and the weak will flounder, no matter what we do. There’s Darwinian law at work, and even the most supportive teacher is powerless to resist. Sorry, kids; it’s survival of the fittest. We forget that weakness isn’t universal. Take Rafaela, who struggled in my highly verbal, proof-heavy Trigonometry class. (“I don’t like math anymore,” she once blurted out in frustration. Not a teacher’s favorite phrase.) But she’s a swift problem-solver with excellent geometric intuition, and has thrived in other math classes, both before and since. Rafaela wasn’t weak overall—just in the particular muscles I was asking her to flex. Different students will appear weak or strong, depending what obstacles we set before them. Applied to a student’s mathematical abilities as a whole, the word weak is too broad, like telling a young athlete, “Sorry, you’re not good enough.” Sure, not everybody will make the NBA. (I certainly came up short—about 9 inches short.) But everybody can improve, whether it’s working on your jump shot, your crossover dribble, or your trigonometric identities. A word like weak serves best for labeling specific areas of need—not for writing off a student altogether. Next up: Low. A low kid is one with low grades. That’s all. No embedded assumptions, hidden agenda, or implied explanations. Low is harmless, but also not very helpful. Kids are low for a variety of reasons. Ernesto failed my class because I caught him cheating on exams. Alberto failed because he slept through lessons and never did homework. (Eventually he revealed that he was working 5–10 p.m. daily at the family store.) Gabriela failed because she skipped school often, and when confronted with an unfamiliar problem, she wilted. Calling all these kids low is like calling all the patients in a hospital sick—technically true, but not terribly insightful. They need individual diagnoses, individual treatment. The problem here isn’t with our language. The problem is that teaching 100 or 150 kids each day doesn’t leave much time for heart-to-hearts with failing students. Unable to develop real insight into their academic ailments, a content-free word like low is sometimes the best that teachers can muster. My personal favorite is struggling. It dramatizes the situation—as if the student is swimming against whitewater currents, doing her noble best to stay afloat. But some students just don’t care. Math strikes them as pointless, or impossible, and they’re perfectly content to surrender to the river without a fight. David, for example, didn’t struggle at all. He eyed trigonometry, decided it wasn’t for him, and promptly failed, my pep talks doing nothing to revive his interest. Jaime Escalante I apparently am not. I do all right with struggling students, but I don’t know how to persuade the unmotivated that the struggle is worth their effort. The meaning of behind (antonym: advanced) varies with the seasons. Behind, in this sense, is a word of humility for teachers. (More darkly, you could call it defeatism.) It’s a confession that, for each student, I am only one teacher in a long lineage. You do your best with a kid like Jonathan, but even your best won’t heal him completely. And you learn not to blame his parents or past teachers, because next year’s teacher could just as easily blame you. So: What’s wrong with unintelligent? Do we really have to beat around the bush, trafficking in politically correct euphemisms? There are three dangers. First, even if we limit our usage of words like dumb to the conspiratorial privacy of the faculty lounge, kids can tell. Such judgments seep into our interactions with them. It hurts to know that the teacher thinks you’re stupid. Second, our judgment can falter. We don’t always know our students as well as we think. It’s easy to overlook latent talents or hidden obstacles. Years ago, my wife Taryn’s second-grade teacher saw her stumbling to read an easy sentence aloud, and immediately labeled her a low kid. It was only weeks later that she noticed Taryn could comprehend and summarize text with the best of them. Pronunciation was her only problem. “Sorry!” the teacher said, and shuffled the future Yale and Berkeley grad out of the remedial reading group. Third, even if a kid does have low IQ, it’s more useful to focus on one area at a time. If a basketball coach told me, “You’re terrible,” (which is accurate), I’d want to give up. I’d rather hear: “Today, we’ll practice your defensive footwork; tomorrow, we’ll run a passing drill; the day after, we’ll work on free throws …” Sure, I might not improve much, but even dwarf trees grow a little. Unsurprisingly, teachers have few qualms about praising students’ intelligence, tossing around words like bright and brilliant and smart. That’s innocent enough (although I wonder how it sounds to the students not earning such accolades). But those two variables—intelligence and work ethic—encompass multitudes. Weak, slow, and behind aren’t just PC synonyms for stupid—they each highlight different facets of education, different causes for failure. Just as doctors don’t settle for classifying various forms of abdominal pain as tummy aches, we need a rich vocabulary to describe what happens in our classrooms.